A recent battlefield tour of Belgium and the Netherlands was greatly enriched by the presence of World War II veterans, including two who served with the Algonquin Regiment in the battles to liberate the Low Countries. Georges Paquette and Ernie Hilts shared their memories with the group and encouraged us not to overlook the 4th Canadian Armoured Division and the “green centre line” marking its route. We began at the Algonquinstraat, a narrow lane on the Moerkerke side of the double canal line that protected the once water-soddened territory in the Netherlands known as the Breskens Pocket (Taking The Breskens Pocket, March/April 2001). Our group then crossed to the north side of the canal to lay flowers at the local memorial. Fifteen miles to the east–at Isabella Polder–the commemorative plaque was a joint product of the regiment and the community and it was there where Georges Paquette explained just how determined the enemy was to safeguard the only land route into the pocket. We also visited the city of Bergen-op-Zoom where Dr. Geoffrey Hayes of the University of Waterloo took us through the battle the Lincoln and Welland Regt., Argyll and Sutherland Highlanders of Canada and South Alberta Regt. fought in the streets. All of this made our time at the Bergen-op-Zoom Canadian War Cemetery more meaningful, but it was evident that few in our group knew much about the battles to liberate the area. The presence of a British military cemetery next to the Canadian graves reminded us that 49 West Riding Div. had fought alongside 4th Cdn. Div. throughout the last two weeks of October 1944. On their right, both the Polish Armd. Div. and the American 104th Timberwolf Div. had joined in an advance that swept the enemy back to the Maas River to the north. The story of the operations to trap, destroy or force the withdrawal of Hitler’s 15th Army is the least known part of Field Marshal Bernard Montgomery’s post-Arnhem strategy. Prior to mid-October, when pressure from Supreme Allied Commander General Dwight D. Eisenhower and his naval commander, Admiral Bertram Ramsay, forced Monty to give priority to opening the port of Antwerp, the field marshal had concentrated on advancing east to Germany. Monty’s directive of Oct. 16 closed down those operations and ordered 12 British Corps to turn north, liberate Hertogenbosch and then move west, with its right flank on the Maas River, to seize Breda and the main escape route–the bridge at Moerdijk. At the same time, First Cdn. Army would coordinate the advance of 1st Corps with its British, Polish and American divisions and the right wing of 2nd Cdn. Corps, 2nd and 4th Cdn. divisions. If all went well, the enemy would be caught and destroyed before they could retreat across the Maas. The enemy was determined to avoid encirclement and planned a series of counter moves designed to save the 15th Army. The vigorous defence of Hertogenbosch and a major counterattack from the east destroyed Montgomery’s plans and left 1st Cdn. Army with the task of advancing to the Maas on a wide front. Lieutenant-General Guy Simonds, the acting army commander, ordered 4th Cdn. Armd. Div. to launch Operation Suitcase on Oct. 20. The immediate goal was the town of Esschen, 12 kilometres east of Bergen-op-Zoom on the Dutch-Belgian border. When this was accomplished the division was to turn west towards Woensdrecht, forcing a German retreat and allowing 2nd Div. to advance to Walcheren Island. Simonds would then bring the full weight of his multi-national 1st Corps into action, attacking north on a 30-mile front. This was the first and last time an American division served under Canadian command and it is worth noting that the legendary Major-General Terry Allen, who had led the 1st United States Infantry Div. in North Africa and Sicily, and who now commanded the Timberwolves, proved to be as co-operative as he was efficient. Allen had trained his men for night operations and under both Canadian and U.S. command, the 104th U.S. Infantry Div. proved to be a highly effective division. The men of 4th Cdn. Div. would soon benefit from the actions of 1st Corps, but the advance to Esschen, which began Oct. 20, 1944, involved heavy fighting and the constant threat of infiltration from the exposed right flank. Esschen was cleared by the Algonquin Regt. after a carefully executed night attack brought the lead infantry battalions to the edge of town. The enemy was relying on improvised battle groups that “fought stubbornly” until the Canadians closed in, then they “surrendered en masse.” The Lincs’ war diary reported the enemy soldiers were quite pleased with their future as prisoners of war. The Canadian mood, however, was much less cheerful. The Germans had sown thousands of mines under the cobblestones of the main road and the sand of the forest tracks. Casualties in what was supposed to be the preliminary phase of Operation Suitcase were mounting rapidly and the soldiers’ natural fear of a weapon that crippled when it did not kill was slowing the advance. The squadron leader of the mine-clearing Flail tanks that were attached to the brigade protested that his Flails would not clear the mines because the thrashing chains did not detonate mines under cobblestones and therefore the tank itself would be blown up. The advance of 4th Cdn. Div. provided immediate help for 2nd Cdn. Div. struggling to overcome German resistance on the Woensdrecht ridge. Sixth Bde., relieved from its role guarding the right flank, took over the sector and on Oct. 23 the Queen’s Own Cameron Highlanders of Canada completed the capture of the village. Sergeant Wilf Kirk of the Camerons led the attack on the last two pillboxes in Woensdrecht while the Calgary Highlanders cleared the eastern end of the ridge. As 2nd Div. turned west towards Walcheren, Major-General Harry Foster tried to implement orders to cut off the enemy forces withdrawing to the north. Fourth Div. employed two balanced brigade groups, each with two infantry and two armoured battalions. This method, first developed in the late stages of the Normandy campaign, proved very effective in the first stages of Operation Suitcase. 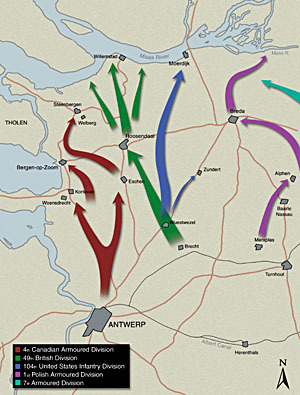 The divisional plan called for Brigadier Robert Moncel’s force to move in a wide circling movement to the north of Bergen-op-Zoom before Jefferson’s brigade moved directly towards the city. Unfortunately, the advance to Wouwsche Plantage was contested by German armour that lay in wait guarding the narrow tracks that ran through extensive pine forest plantations. Within minutes, enemy self-propelled guns knocked out 10 of the lead squadron’s tanks. When the Lake Superior Regt. moved to deal with the obstacle, the enemy withdrew to a reserve position. Infantry attacks, even with tank and artillery support were complicated by the enemy’s liberal use of minefields, including ones that had been booby-trapped to counter the pioneer platoons normal methods of defusing them. It took Moncel’s force three days of bitter costly fighting to reach the railway line northeast of Bergen-op-Zoom and by then Jefferson’s brigade was on the outskirts of the town. The story of the entry into Bergen-op-Zoom is part of the lore of both the South Alberta Regt. and the Lincoln and Welland Regt. Both Hayes and Don Graves have described the events in their superb regimental histories. Both accounts provide details which flesh out the brief sketch that follows. Signs of an enemy withdrawal were evident even after the capture of Wouwsche Plantage and a battle group of Lincs and South Albertas moved cautiously forward. Despite the darkness of the late afternoon, civilian reports that the enemy had withdrawn to a position on the northern edge of the city tempted the two commanding officers if for no other reason than to get their men out of the pouring rain. Major Jim Swayze, who commanded a Lincs company, got his men moving by telling them: “They’re in there and they’re nice and dry…. Are we going to stay here and get soaked? No way.” Swayze’s men, with a squadron of tanks, advanced to the Grote Market where the Hotel de Draak was commandeered. Tanks were soon stationed at the head of each of the northern facing streets with orders to keep the roads empty. The next morning, the Dutch flag flew proudly from the town hall for the first time since 1940. But the battle for Bergen-op-Zoom was far from over. The situation along the Zoom River, where blown bridges and a line of anti-tank obstacles assisted the German defenders, remained precarious until the morning of Oct. 24. For the Argylls, Bergen-op-Zoom was anything but a happy adventure. The battalion was ordered to make a set-piece attack across the Zoom and the wide drainage canal that served as a tank obstacle. Short rounds from the medium artillery and well organized German resistance brought the first attempt to a grinding halt. Casualties from friendly fire were a constant problem in WW II, but since no one wanted to attack without the largest possible amount of support, accidental losses had to be accepted. A second attack also failed and this left a small group of Lincs, who had tried to divert German attention, isolated on the enemy side of the canal. Between 3 a.m. and dawn, a third attempt brought a kind of success and the Argylls and a company of Lincs began the difficult task of clearing close-packed buildings defended by enemy machine-guns. By mid-afternoon, Jefferson committed the Algonquin Regt. and the South Alberta Regt. and both units helped complete the task. The Argylls had nine killed, 29 wounded. The Lincs had 11 killed, 27 wounded. By the time the battle at the Zoom was over, Moncel’s force had broken out of the woods and reached the flat, open country north of the city. The enemy appeared to be in full retreat toward the Maas. This forecast, like so many other intelligence reports from northwest Europe, was based on the belief that the German army would behave rationally. With the British in Roosendaal–a town located roughly seven miles east of Bergen-op-Zoom–and other Allied forces, including a squadron of the Manitoba Dragoons, moving up quickly on their right, the Germans had only a few days to make their escape. The German high command, with Hitler watching over its shoulder, decided to try and hold on to some bridgeheads on the south side of the river, a policy that was to cost their army and the Allies many casualties. When operations ended Nov. 8, the Germans held just one bridgehead at a place called Kapelsche Veer. The enemy’s decision to contest the Canadian advance became evident when Brig. Moncel outlined plans for a rapid strike to Steenbergen, northeast of Bergen-op-Zoom. The Canadian Grenadier Guards were teamed with the Algonquin Regt. for a night advance that was supposed to reach the edge of Steenbergen while two infantry companies dealt with opposition from the nearby villages of Bocht and Welberg. Their cross-country attack on the villages quickly turned into a nightmare when both companies were overrun by German battle groups led by self- propelled guns. In this flat country, a slight rise–like the one at Welberg–dominated the area, and with many of the fields flooded and the roads mined, the armoured regiments would only provide indirect support. This meant a full-scale infantry attack with a divisional artillery fire plan, medium artillery and all the Typhoon aircraft 84 Group could spare. The Algonquins and the Lincs launched the second attack on Welberg on Nov. 2. The artillery and a squadron of rocket firing Typhoons turned the village into a blazing beacon and this gave the infantry enough light to aid the advance. Once in amongst the ruins, an intense close-quarter struggle lasted well past dawn. By then engineers had cleared the road and the self-propelled 17-pounders of the 5th Anti-Tank Regt. had moved up to deal with their enemy counterparts. It was now the Argylls’ turn to lead and this time everything went smoothly. The enemy had finally decided upon a general withdrawal and Steenbergen was left largely undefended. The next day 4th Div. was squeezed out of the advance north by the arrival of 49th West Riding Inf. Div. However, one task remained. The tanks of the British Columbia Regt., working with the Lake Superior Regt., pursued stragglers who were retreating to the islands of Tholen and Schouwen. This led to the Canadian Army’s only naval battle in which British Columbia Regt. tanks sank three small German naval vessels. The battles fought by 4th Cdn. Armd Div. in October and November 1944 have been overshadowed by the more dramatic encounters at the Leopold Canal, Woensdrecht and the Walcheren causeway, but they were no less important and demanded no less courage or sacrifice. One of the most persistent themes in veterans memories of this period is the shortage of reinforcements and the limited skills of the new arrivals. It is important to note that many of the reinforcements, transferred to the infantry from other corps, were naturally hesitant and uncertain when first sent forward. We know that many of them became fine soldiers, ready in their own turn to worry about the raw, green reinforcements who arrived in 1945. The more basic problem was sheer numbers and in the circumstances of November 1944 it could only be solved by enforcing conscription for overseas service. It was the promise of a large supply of well trained conscripts for the battles of 1945 that allowed the army to prepare for the last phase of the war, confident that the men at the sharp end would not be let down by their government. The small Orde Dienst Tholen (Dutch Resistance Group) recieved orders on Oct. 30 to take and hold Oud-Vossemeer. In doing so, the whole Isle of Tholen fell in their hands. They were kept in a fight with a company of Fallschirmjäger Regiment 6 until Nov. 4 when Nieuw-Vossemeer was liberated by the Canadians. The German lost about half the company. The O.D. lost 2 KIA and 1 WIA. The first KIA was during the short recce of a Canadian scoutcar who visited Oud-Vossemeer and Stavenisse. Therefore the writer should have written the peninsula St.Philipsland instead of Isle of Tholen.